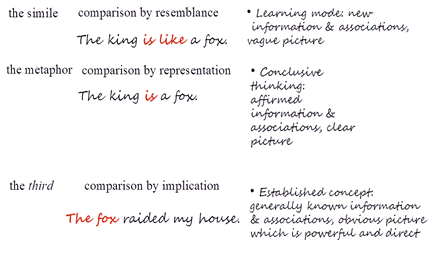 Here is another example of the third type of comparison. 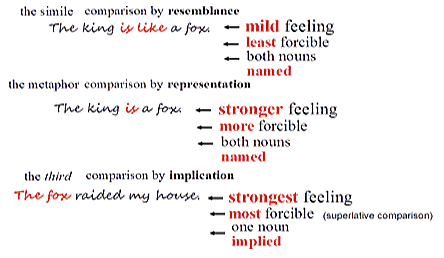 The identity or name which is represented as “the fox” is implied from the greater context, not immediately indicated explicitly, but obviously understood. 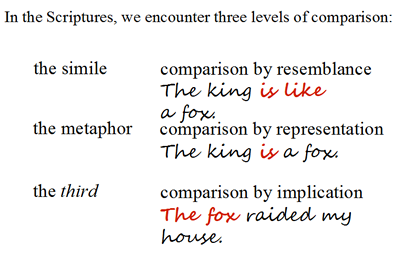 This idea which is applicable in helping us understand some of the differences between these three types of comparisons, comes from something Charles said last night, about narrowing bandwidth. 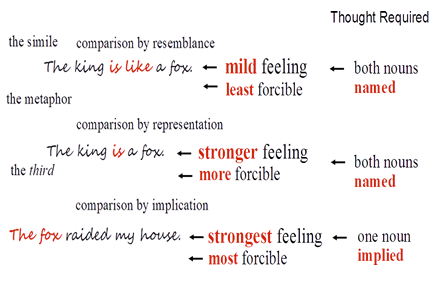 If we think of the simile as a type of comparison which requires us to keep looking back and forth between two previously unassociated ideas or things, then we might describe that initially huge gap between them as a wide span or bandwidth. 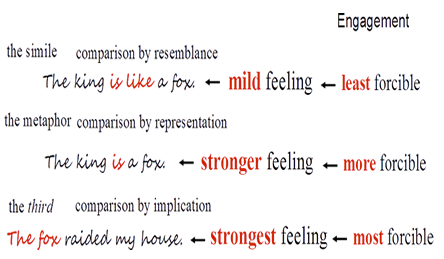 Then, as we become more familiar with, and begin to understand, the actual similarities that exist, the initial span or bandwidth becomes more narrowed, until we are able to think in terms of the simile [comparison by similarity], where the name is relatively close to the figure. 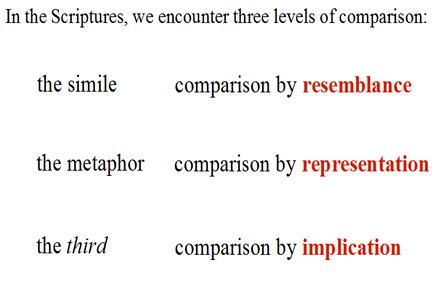 After having invested effort in coming to understand the similarities of the simile, it becomes easier for us to think in terms which narrow the bandwidth down to a side-by-side-kind-of-relationship of the metaphor [comparison by representation], where the name is placed side-by-side with the figure. 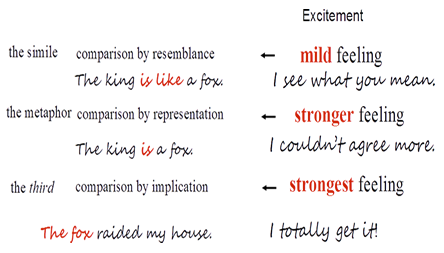 metaphor, it is easy for us to think in terms which can be represented by narrowing the bandwidth down to a precise point on the spectrum scale, to the hypocatastasis [comparison by implication], where the name of the thing is placed down underneath the figure. 53And He led them on safely, so that they did not fear; But the sea overwhelmed their enemies.
" I will surely assemble all of you, O Jacob, I will surely gather the remnant of Israel; I will put them together like sheep of the fold, Like a flock in the midst of their pasture; They shall make a loud noise because of so many people. For the idols speak delusion; The diviners envision lies, And tell false dreams; They comfort in vain. 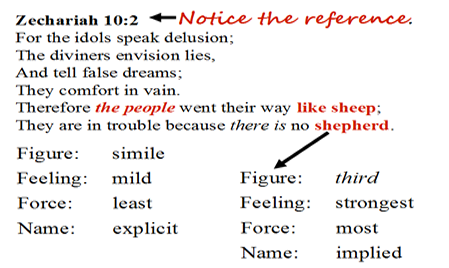 Therefore the people went their way like sheep; They are in trouble because there is no shepherd. Again, the statement that the con- gregation has no shepherd is more important than the statement that the congregation is like sheep. Matthew 9:35-36 Notice the reference. We totally get it that God is the Shepherd of the ages. 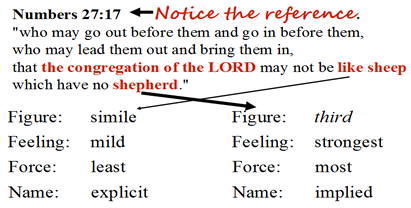 When we encounter the figure “Shepherd” in the hypocatastasis form we immediately think of the figure as “God”. When we encounter the figure “the Shepherd” in the strongest form in the OT, the hypocatastasis, we immediately think of the name underneath the figure as “God”. 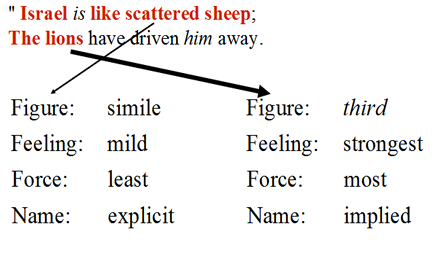 When we get to the New Testament, and encounter hypocatastasis references to “the Shepherd”, we have no trouble thinking of the name underneath the figure as “Jesus”. 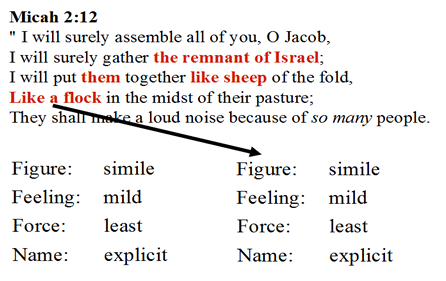 We also need to make the connection from the NT back to the OT in terms of realizing the major significance of the fact of prophesy having been fulfilled. Not only is the Shepherd of the OT the Person of Jesus the Christ, the words of the prophets are effectively the words of Christ. Christ not only spoke these words through faithful servants of God, He personally fulfilled them. When we looked at John 6.63 last week, the words which Jesus referred to are not limited to those which He had spoken while on earth, but also to the words which He had spoken through the prophets. of beneficial assistance to the work of the Holy Spirit in effectually creating spirit quality and life quality in us who are true believers. "Woe to the shepherds who destroy and scatter the sheep of My pasture!" says the LORD. Many will be surprised on the Day of Judgment when they discover that it was just as the Word of God says; only the righteousness of Christ is able to save you. All men are sinners and no one can save himself. God is just, so He must punish sin; but He is also merciful, moreover gracious, and offers His Son as the perfect sacrifice in order to purchase a place for you in heaven, which He offers to you as the free gift of eternal life. Jesus is the Christ, the Messiah, the Anointed One, He is God Incarnate. and ask Him to come into your life right now, and to give you eternal life.